The values in this chart reflect coins graded by PCGS or NGC, no guarantee raw coins will sell for this much. 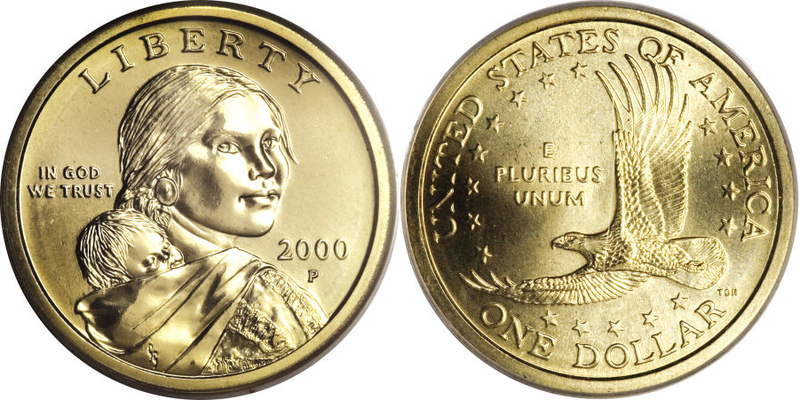 Usually raw Sacagawea Dollars sell for $1 to $3 and the actual sell price depends on many factors. 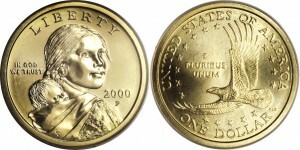 Sacagawea Dollars series does not have any key dates and most are worth face value, but some choice examples might bring $2. The real value is when they’re graded by PCGS or NGC, more on grade value next. One important note about these coins is that they’re golden in color but they’re NOT gold coin. The metal composition is listed further down in this article but Sacagawea Dollars are mostly copper. The most valuable Sacagawea Dollars are graded at least MS68 (Mint State) and must be graded by PCGS or NGC to realize the values for MS68 and up. It’s not easy finding a Sacagawea Dollar that will grade that high but lesser grades like MS67 and MS66 are just not worth the fees for having them graded. Although if you can find such a mark free specimen, as an MS68 or better, it would be well worth the trouble of a submission. For example a 2001-D can sell for up to $225 and a 2006-D can sell for up to $4,500. The varieties are few in this series but they’re extremely valuable, just remember grade of the variety is still a factor in value. You have the famous 2000-P Cheerios Dollar with a value of $3,500 in MS63, the 2000-P Wounded Eagle at $285 in MS63 and the (2000) Mule with State Quarter reverse at $40,000 in MS63. All of these rise in value as the grade increases. Designer: Obv: Glenna Goodacre. Rev: Thomas D. Rodgers Sr.
A Sacagawea Dollar value depends on the grade or it it's a variety.